Mix flour, sugar, baking powder, salt, and nutmeg together. In a separate bowl, mix the egg, milk, vanilla extract, and butter. Make sure the melted butter has cooled enough that it will not cook the egg when added to the wet ingredients. Adding your wet ingredients, to your dry, whisk together to form your batter. Once thoroughly mixed, fold in the diced strawberries. Pour your batter into either a gallon Ziploc bag or an icing bag. Snipping a hole into one corner of the bag, use to pipe the batter into a greased doughnut pan. Bake the doughnuts for 12-13 minutes. I baked for exactly 12 and then allowed the doughnuts to rest in the pan for 5 minutes before popping them out. 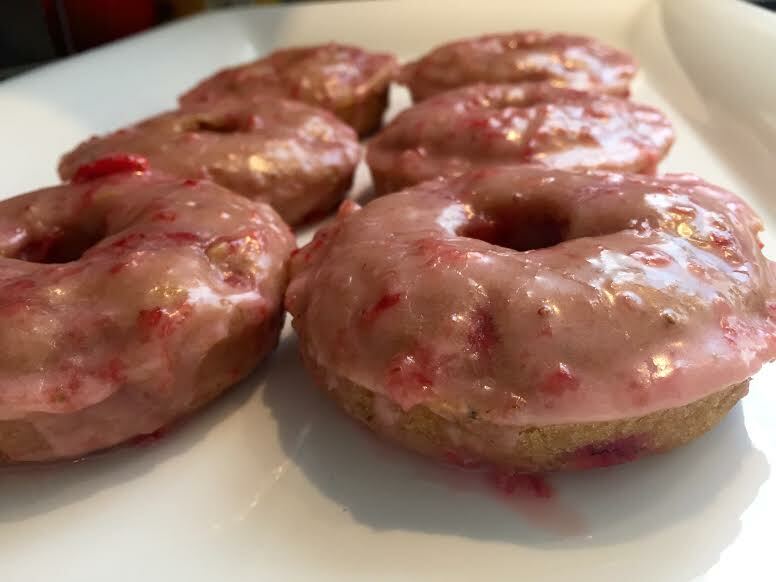 Glaze – to make your icing, begin by adding the strawberries, the milk and the vanilla extract into a food processor or blender to puree together. Once pureed, add this mixture to your powdered sugar and whisk until the glaze is formed. Immediately upon popping your doughnuts out of the pan, brush the glaze on each one. Allow the glaze to set for 3-5 minutes, and add another coat. I ended up having enough glaze to brush on three coats. 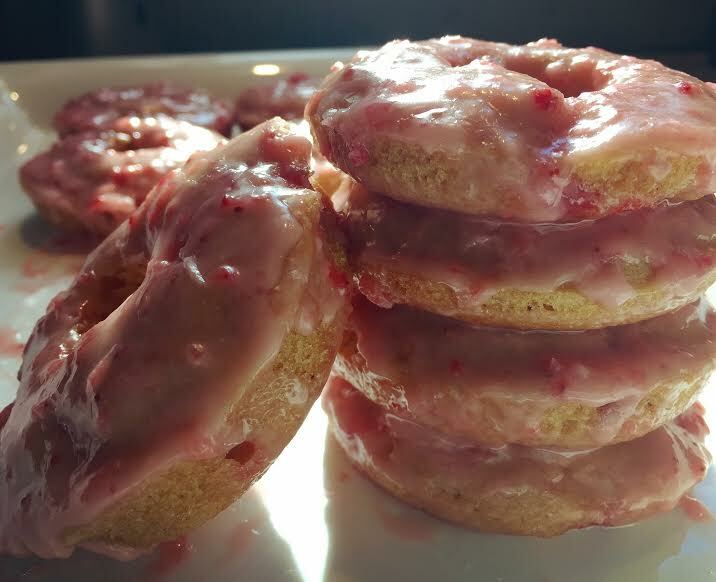 The multiple layers of glaze created a beautiful pink color and cracked perfectly when I ripped into the first doughnut.